For open_2012 Hannes Egger explores the miraculous properties of boundaries. A meeting with a geologist and a botanist leads him to discover that plotting the Insubrica Line in Valle Camonica is a feasible task. One can make out the points of contact, fusion and overlapping between the African and the European terrestrial plates which collided to form the Alps. Hannes Egger’s performance consists in installing a classic carved boundary stone and a roadsign marking the Insubrica Line and set up on a country road. 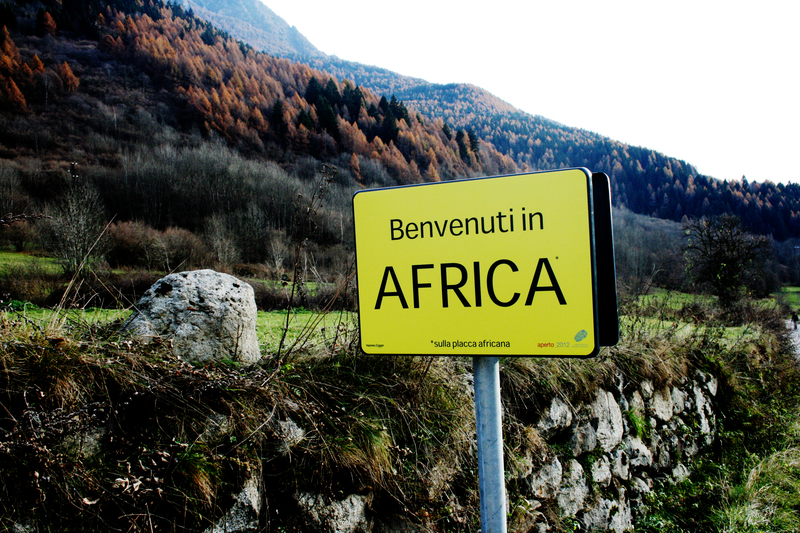 The sign makes use of the official kind of roadsign and welcomes the passerby to Africa or Europe depending on which way they are going. “Welcome to Africa” is the work’s title; it is accompanied by two other works. “How to cross the Borderline” is the map of the Insubrica Line, on the back of which is printed a modified verseion of the instructions the Mexican government issues to anyone intending to cross illegally into the United States. “Insubrica Line” is a display cabinet telling the story of the leap across a time vacuum performed by all the cars that daily cross over from the African to the European plate. The cabinet also contains prints of ‚African‘ and ‚European‘ plants, along with a few objects – a glove, a piece of banner – which unknown crossers of the line have strewn behind them.